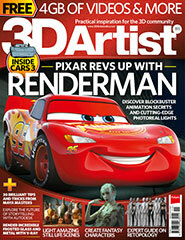 I did an interview with 3d artist magazine 111 about my career, I talk about my passions, how I started on 3d, my studies, my past jobs and what Im doing exactly at Scanline. Some day to day work, some recent shoots explanations in Power Rangers and in Guradians of the Galaxy 2, and also my relation with Cebas and what I do when betatesting the program. Its a interview in 2 pages! you can get the magazine booth digital and printed!Thanks to Cedar and Carrie to make this possible.